See in this article the new selectors of the CSS3 and how they can help us to select elements individually, filtering by its attributes, position and state. 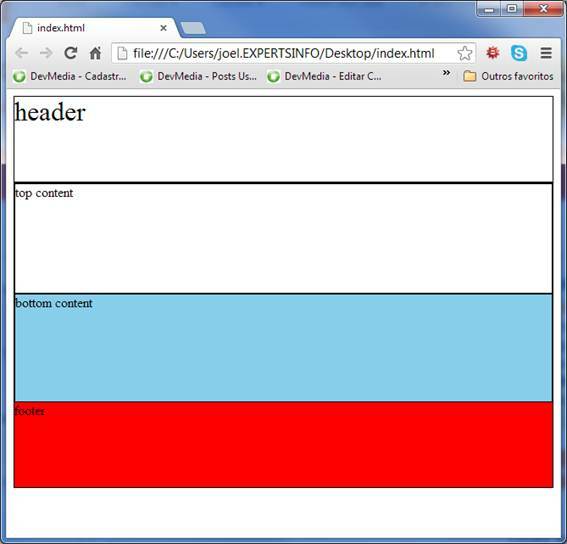 With the arrival of the CSS3, applying styles individually has become way easier. The new selectors can identify elements based on it's attributes, the position in which they appear in the parent element, the state (enable, disabled), among other properties. We'll have here some overview about these selectors and then we shall have practical examples of them. These selectors allow to apply one determined formatting to certain elements based on the value of one attribute. For instance, we can select all the <div> elements that contain the word “bar” on it's id (to superior, inferior, and lateral bars, for example). E[attribute=”value”]: Elements of E type which “attribute” is equal to its “value”. E[attribute^=”value”]: Elements of the E type which the value of the “attribute” starts with the word “value”. E[attribute$^=”value”]: Elements of the E type which the value of the “attribute” finishes with the word “value”. E[attribute*=”value”]: Elements of the type E which the value of the “attribute” contains the word “value”. Let us see in practical terms the functioning of these selectors. 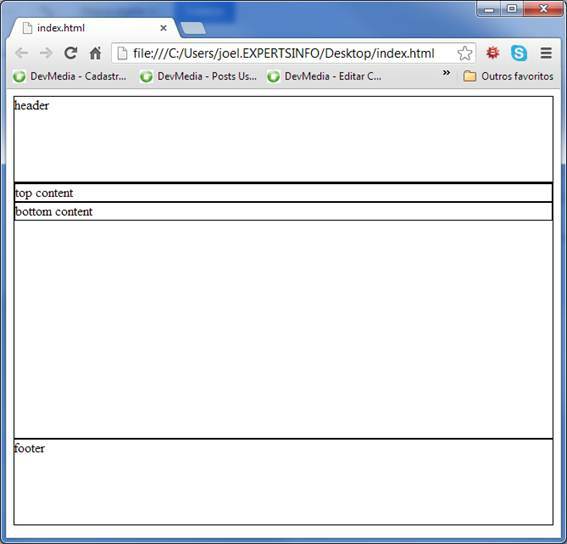 For this, we should alterate the content of the file “selectors.css” as on the Listing 2. We have defined a special starting formatting just to give the shape to the page and ease the visualization of the style that will be posteriorly applied. The page should have an appearance similar as Figure 1's. 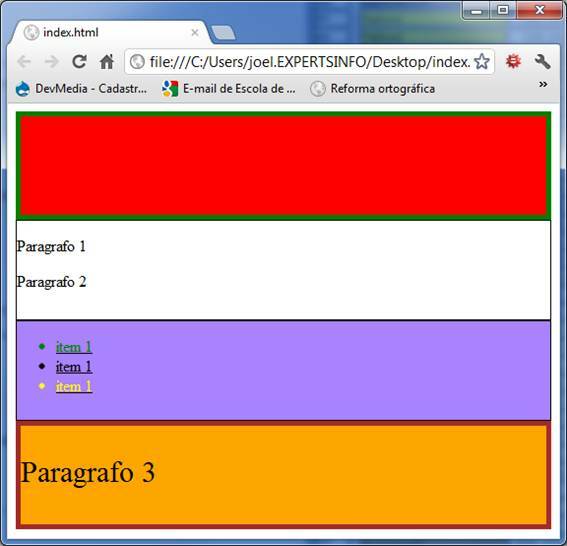 Listing 2: Example of CSS for selectors of attribute. After applying the code of the Listing 2, the page should be as in Figure 2. These selectors work based on the position of the element in the document or in the control that contains it (parent element). For instance, we can select the second element inside a div, no matter it's type. 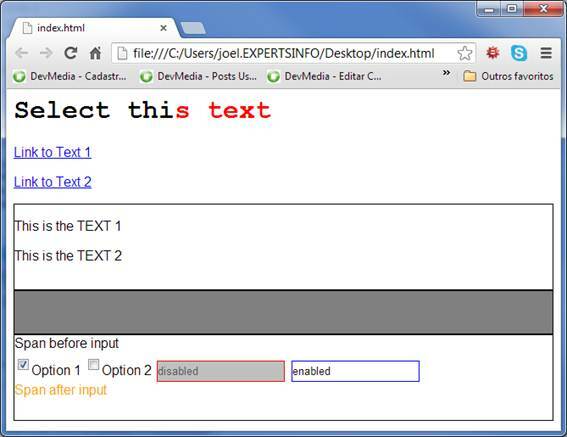 :root: selects the root element of the document, in this case, the HTML tag. E:nth-child(N): selects the element of the E type that is the Nth child of his father element. E:nth-last-child(N): similar to the previous, but starting the counting backwards. E:nth-of-type(N): selects the element that is the Nth of it's type. E:nth-last-of-type(N): similar to the previous one, but counting backwards. E:last-child: selects the E element that is the last child of it's parent element. E:first-of-type: selects the E element that is the first of it's type inside the parent element. E:last -of-type: like the last one, but works to the last element. E:only-child: selects the E element that is the only child of it's parent element. E:only-of-type: selects the element that is the only child of a type inside it's parent element. The page should be, initially, as shows the Figure 3. 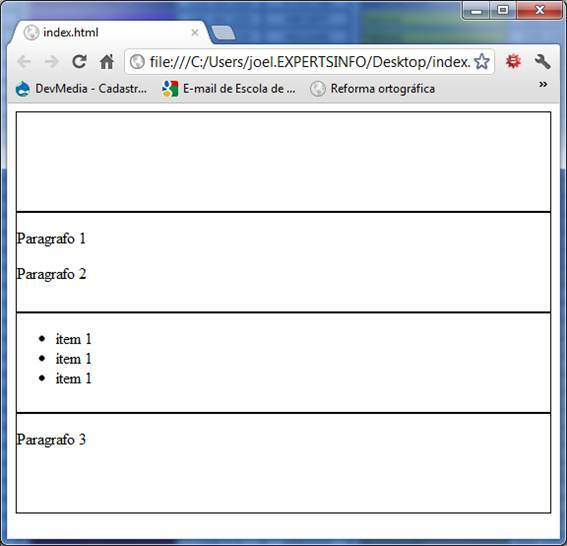 Figure 3: Initial appearance of the page in the second example. Now, we'll alter the content of the file “selectors.css” as it is on the Listing 4. Listing 4: Examples of CSS to selectors of position. Then, after applied the code on the Listing 4, the page should be similar to the Figure 4. This ones, on the other hand, work based on the actual state of the control (empty, enabled, disabled, etc). Hereafter, each one is explained, easing the understanding. E:empty: selects the E element that is empty, with no child element. :target: selects the target element of an internal link (the ones that are preceded by # that directs the user to an element on the page). E:enabled: selects the E element that is enabled to the user. E:disabled: similar to the previous one, but to disabled elements. E:checked: selects checked elements (radios and checkboxes). 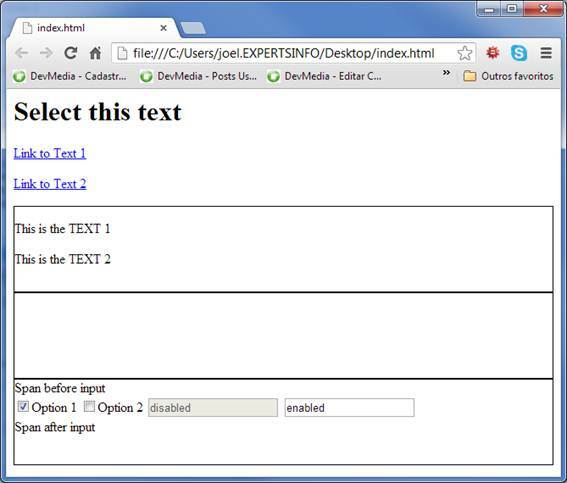 ::selection: formats the content selected by the user. 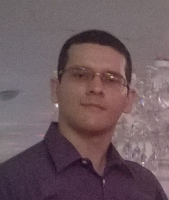 :not(P): selects the elements that do not respond to the simple P selector. E~F: selects every F element that is preceded by an element E.
And once again we'll alter the content of the file “selectors.css”, but this time according to the Listing 6. Have doing this, the page must assume the shape showed on the Figure 6. As we could see, the many CSS3 selectors enable us access the specific controls in our HTML structure, easing, for instance, the conditional formatting of these elements. We finish this article here, and I hope it has been of help. Thanks for the attention of the reader.